How to install TH on 64bit system? I have an old iso from CD I had of Theme Hospital with original installer. Unfortunately, I have 64bit OS. What to do? Or will it be enough to only extract the iso and select it folder while installing CorsixTH? Re: How to install TH on 64bit system? Just be sure to use the 64 bit version of CorsixTH. Didn't work. Some errors showed up with missing stuff. But never mind, I downloaded TH from bestoldgames... But its only 15MB's?! Should it be larger? I mean my old iso is 160MB. Am I possibly missing something in game because of this? I guess you have downloaded the DEMO version. This means it's very limited. Are you sure you selected the right folder when installing corsixth with your iso? And you extracted the iso onto your hdd? I know some people have had problems when using the game files right from the iso (emulated). Yes Im sure I specified the right folder and I extracted whole iso with WinRAR. Ok I have it! 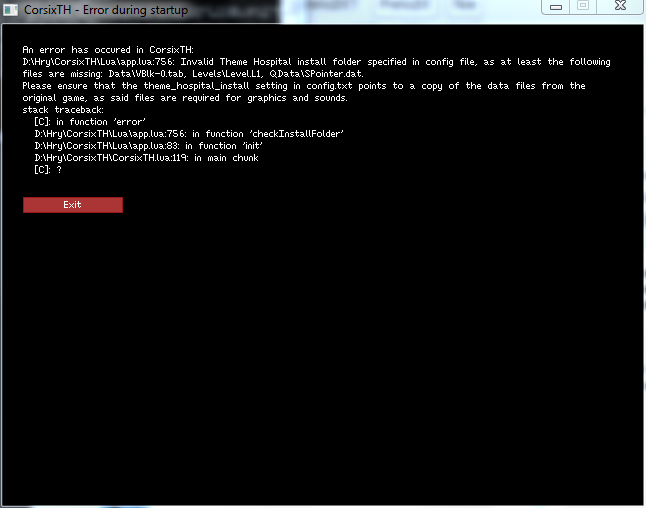 It works from ISO, you just need to specify folder 'HOSP' on iso, not just the whole iso folder. And woala, no errror. Yes, you have to choose you HOSP folder. Sorry, I thought you knew that. You can change game speed by the number buttons 1 to 5, 3 is "normal speed". What version of CorsixTH are you using? I mean that normal speed is little bit slow for me, and option after it is very fast. Needs something in the midle..
Hm, what I do is that I turn down, or even pause the game (P) when I need to build something, and the speed up afterwards.